West Virginia University Libraries selected Elizabeth Satterfield and Rachel A. Wattick as 2018 Robert F. Munn Undergraduate Library scholars. 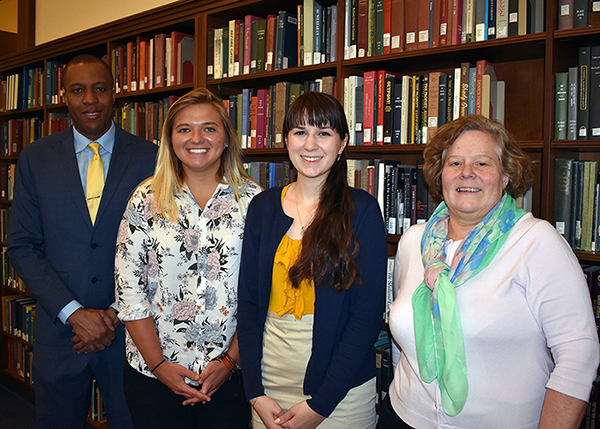 Munn Award winners Rachel A. Wattick (second from left) and Elizabeth Satterfield pose with Damien Clement, assistant dean of the Honors College, and Karen Diaz, interim dean of WVU Libraries. The WVU Libraries and the Honors College established the Robert F. Munn Undergraduate Library Scholars Award in 2009 to honor Dr. Robert F. Munn, dean of Library Services from 1957-1986. The award goes to one or more Honors students for an outstanding humanities or social sciences thesis based on research conducted in the WVU Libraries. Along with a $1,000 award, the scholar’s name is added to a plaque in the Downtown Campus Library. Satterfield, a junior from Independence, W.Va., won for her thesis, “Swiss Settlement in Randolph County, West Virginia: A Study of Land Deals, Policies, and Immigration,” which details the settlement of Helvetia, W.Va. While the Helvetia community has been covered from a cultural perspective, Satterfield’s extensive research at the West Virginia and Regional History Center illuminates a different dimension of the town by focusing on the sometimes shady land deals in the county. Helvetia captured Satterfield’s attention when she first visited the small town a few years ago, but her interest grew when she came across Joseph H. Diss Debar while exploring potential research topics. Diss Debar designed West Virginia’s state seal and was involved in immigration and Swiss settlement. Groups targeted immigrants through thousands of advertisements across the United States and in Switzerland, Germany and France. “They would advertise ‘flat, good land’; but when settlers arrived here, they were sold wilderness that was a hillside that was rocky and not good for farming. So that was one of the swindles that occurred after the Civil War,” Satterfield said. Satterfield completed her thesis early and will graduate in May 2019 with a bachelor’s degree in history and plans to pursue a master’s in historic preservation or public history. Wattick, of Canonsburg, Pa., won for her thesis, “The Relationship between Dietary Quality and Mental Health in a Young Adult Appalachian College Population.” The paper relied not only on primary research conducted by Wattick but also in-depth secondary nutrition and medical research. Wattick’s work represents an important investigation into mental and public health issues in Appalachia. While working in the Lifestyle Intervention Research Lab over the past two years, Wattick began studying nutrition and mental health, which is a new field. The focus has long been on the physical aspects of a poor diet and how it affects your mental capacity. Typically, college students have problems with easily accessing healthy foods, and they face high-stress risk factors. She hopes research showing this relationship will encourage the University to implement efforts to support healthy eating. Wattick will graduate with a bachelor’s degree in Human Nutrition and Food, and plans to stay at WVU to earn a Ph.D. in social and behavior sciences from the School of Public Health.